If you're looking for the list of 2018 holidays in the Philippines, click HERE. 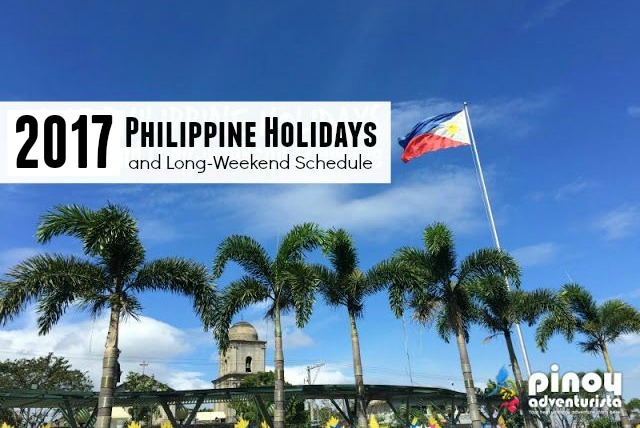 Discover the complete list of Philippines' public holidays and long weekends for 2017! Start planning to make the most of these holidays! Malacañang Palace had officially issued Proclamation No. 50, s. 2016, DECLARING THE REGULAR HOLIDAYS AND SPECIAL (NON-WORKING) DAYS FOR THE YEAR 2017 which was signed by President Rodrigo Duterte in Malacañang Palace last August 16, 2016. With this list of holidays in 2017 and list of long weekedns, we can now start planning for our travels and vacations for next year. The proclamations declaring national holidays for the observance of Eid’l Fitr and Eidul Adha shall be determined later. This post will be updated as soon as the exact dates of Eid’l Fitr and Eidul Adha 2017 were determined. We will be enjoying at least 7 LONG WEEKENDS in 2017. Here's the list of the 2017 Long-weekend Schedule. If Eid’l Fitr and Eidul Adha 2017 fall on the estimated dates, there will be additional 2 long weekends.